The Minnesota Vikings were struggling with a 3-5 record and had yet to win a road game as they faced the New York Giants at the New Jersey Meadowlands on November 13, 2005. Head Coach Mike Tice’s team was without starting QB Daunte Culpepper, who went down with a season-ending knee injury two weeks earlier, and 37-year-old Brad Johnson was in his place. The receiving corps had no one of the stature of the talented but troublesome Randy Moss, who had departed the previous offseason, and the running game was only fair. The Giants were coached by Tom Coughlin and 6-2 following three straight wins. Second-year QB Eli Manning was playing well and RB Tiki Barber was a consistent running threat. The receiving corps was a good one, with WR Plaxico Burress and TE Jeremy Shockey the favored targets. The defense was strongest on the line, where DE Osi Umenyiora was a rising talent. There were 78,637 fans in attendance at Giants Stadium. The Vikings got a break right at the start when WR Willie Ponder fumbled the opening kickoff and CB Antoine Winfield recovered at the New York 27. However, they were unable to capitalize when the offense couldn’t move and Paul Edinger missed a 40-yard field goal attempt. The teams traded punts until FS Darren Sharper (pictured above) intercepted a pass by Eli Manning to give Minnesota the ball once again in New York territory at the 17. And once again the visitors failed to make the most of the opportunity when Edinger tried another field goal attempt that was blocked by DT Damane Duckett. The teams again exchanged punts following short possessions, but as the first quarter wound down the Giants were on the move. 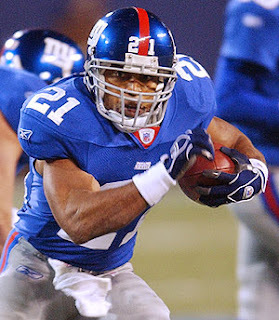 Tiki Barber carried five times for 20 yards and Manning ran the ball himself twice for 24, the first an 11-yard gain that converted a third-and-11 situation. The second quarter began with the ball on the Minnesota 11, but on the first play Manning’s pass intended for Plaxico Burress was intercepted by Sharper, who returned it 92 yards for a touchdown. Edinger added the extra point and in stunning fashion the Vikings held a 7-0 lead. Starting from their 25 following the ensuing kickoff, the Giants again drove into Minnesota territory. The big play was a throw from Manning to Barber that picked up 48 yards and another pass to FB Jim Finn gained 12 yards to the Minnesota 17. The advance stalled there and Jay Feely kicked a 35-yard field goal. The Vikings again had to punt following their next series and New York went 49 yards in nine plays. Manning had completions to Burress for 15 yards, Barber for 9, and WR Amani Toomer for 8, and Barber contributed a 13-yard run. Feely booted another field goal, of 40 yards, and it was a one-point game at 7-6. Minnesota was still unable to move on offense and the resulting punt was returned 55 yards by RB Chad Morton to the Vikings’ 27. But now it was New York’s turn to fail to capitalize when, after reaching the 10, Feely missed a try for a field goal from 28 yards. The score remained unchanged at the half with Minnesota in front despite having gained only six yards on offense. The Vikings started the third quarter off in a big way as WR Koren Robinson returned the second half kickoff 86 yards for a touchdown. Edinger’s PAT put the visitors up by 14-6. New York responded by driving 85 yards in seven plays. A pass interference penalty on Winfield picked up 40 yards and Manning connected with Toomer for a 23-yard TD. Feely added the point after and it was once again a one-point contest at 14-13. Minnesota put together a promising series in which Brad Johnson threw to Robinson for a 44-yard gain to the New York 27, but an offensive pass interference penalty moved the Vikings back and they ended up having to punt. A three-and-out series by the Giants also resulted in a punt, and RB Mewelde Moore (pictured at left) ran it back 71 yards for yet another touchdown on a return. Edinger added the extra point and the Vikings led by 21-13. The Giants had to punt following a short series and the teams then exchanged turnovers, with Minnesota RB Michael Bennett fumbling the ball away at his own 40 and Manning giving up an interception to CB Brian Williams. As the game continued into the fourth quarter, the punts continued. The Giants finally put together a promising drive, starting from their 44. Manning completed three passes, the third to Jeremy Shockey for a gain of 19 yards to the Minnesota 11. But a throw into the end zone was picked off by Sharper, his third of the game, and he returned it 31 yards. The interception seemed as though it might be the game-clinching blow, but with 3:40 remaining in regulation, the Giants used all of their timeouts as the Vikings ran three plays and punted. New York then advanced 67 yards in eight plays, with Manning successful on three straight passes to start things off and Barber running for 11 yards. A defensive holding penalty moved the ball to the Minnesota 21 from where Manning completed a pass to Barber for 18 yards. Barber ran for a three-yard TD, and then again for the two-point conversion, and the score was tied at 21-21. The clock was now down to 1:15 as the Vikings, who had not done at all well offensively, began to move down the field. Osi Umenyiora sacked Johnson on the first play, but the quarterback then connected on his next four throws. The drive halted at the New York 30 and Edinger, who had missed twice from shorter distances earlier in the game, kicked a 48-yard field goal with ten seconds left. The Vikings won by a final score of 24-21. It was the first time in NFL history that a team returned a punt, kickoff, and interception for touchdowns in the same game, and Minnesota would not have won without them. The Giants dominated in total yards (405 to 137) and first downs (25 to 11) as the Vikings had their worst output of the season. They also recorded four sacks, to two by Minnesota. However, New York turned the ball over five times and drew seven flags, to one turnover and seven penalties by the Vikings. And the coverage units for the Giants were burned for the two scoring returns. Brad Johnson completed 18 of 31 passes for 144 yards and no touchdowns, but also no interceptions. Michael Bennett led the Vikings in rushing with 16 yards on 19 carries and had another 11 yards on 6 catches. Jermaine Wiggins also caught 6 passes, for 42 yards, and Koren Robinson led the team with 44 yards on his lone reception. However, Robinson also averaged 39.5 yards on four kickoff returns that included a TD and, with the long scoring return, Mewelde Moore averaged 29.0 yards on three punt returns. 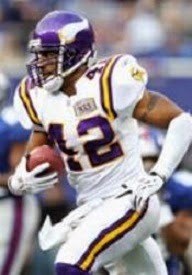 On defense, Darren Sharper intercepted three passes and returned them for 123 yards and a touchdown. For the Giants, Eli Manning, who had difficulty reading Minnesota’s shifting coverages on defense, was successful on 23 of 48 throws for 291 yards and a TD, but gave up four interceptions. 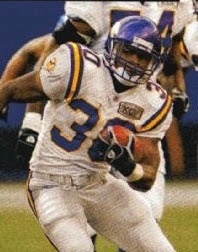 Tiki Barber (pictured above) ran for 95 yards on 23 attempts that included a touchdown and also had 8 catches for 111 yards. Amani Toomer contributed 6 pass receptions for 61 yards and a score. “I’m glad the guys figured out that we can win the game on defense and special teams,” said Minnesota’s Coach Tice. The win over the Giants was part of a turnaround by the Vikings as it marked their second of an eventual six straight wins on the way to a 9-7 record and second place finish in the NFC North. New York bounced back to win the next week and topped the NFC East at 11-5, although the Giants were shut out by Carolina in the Wild Card playoff round. Darren Sharper went on to intercept 9 passes, which led the NFC, while topping the entire league by returning them for 276 yards and two touchdowns. He was named to the Pro Bowl. Koren Robinson was also selected to the Pro Bowl as he led the conference in kickoff returns with a 26.0 yard average and accounted for 1595 all-purpose yards.